The first in a series of readable factsheet-style reports focuses on the opportunities and challenges identified by the diverse stakeholders across Ontario’s organic value chains. The reports draw on 6 different studies that were conducted throughout 2011 – 2012. “Our research tried to characterize all the organic markets in the province from small producers selling through Community Supported Agriculture programs to large global grain handlers,” explains lead researcher, Theresa Schumilas. The first report notes that most stakeholders in Ontario’s organic sector expect continued growth in the market and only 9% feel the demand for organic food has peaked. Across all business sizes, 72% of organic operators feel that organic markets are diversifying particularly through local (Ontario) distribution channels such as food hubs and buying clubs. Further, 78% of stakeholders from right across the organic value chain feel that shoppers will increasingly pay fair prices for foods that are both local and organic. 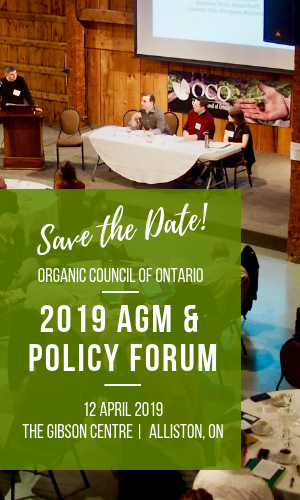 “It’s great to see how optimistic the sector is,” notes Jodi Koberinski, Executive Director of the Organic Council of Ontario, “but there are also challenges to address.” The largest challenge ahead for the organic food system uncovered by the research is the consumer confusion about organic and ‘natural’ claims. “The data seem clear that Ontario’s organic food system needs to face and respond to new market entrants who are making green and ethical claims,” notes Koberinski. Significantly, the report finds that the historic separation between ‘artisanal’ or ‘direct to consumer’ channels and ‘mainstream’ or ‘wholesale’ markets seems to be blurring. The largest producers in the sector are now seeing opportunities in local channels, while the smallest are pursuing sales to supermarkets and natural food stores. This first report, along with a series of others to follow, are being released throughout Organic Week which runs from September 22-29. The reports can be accessed here. Regarding this research – Theresa Schumilas, Lead Researcher.